BRIGHTON — Students raised their right hands on Sept. 22 and took an oath to represent their school the best they could at the Charter School student council inauguration held at the Brighton Veterans’ Building. 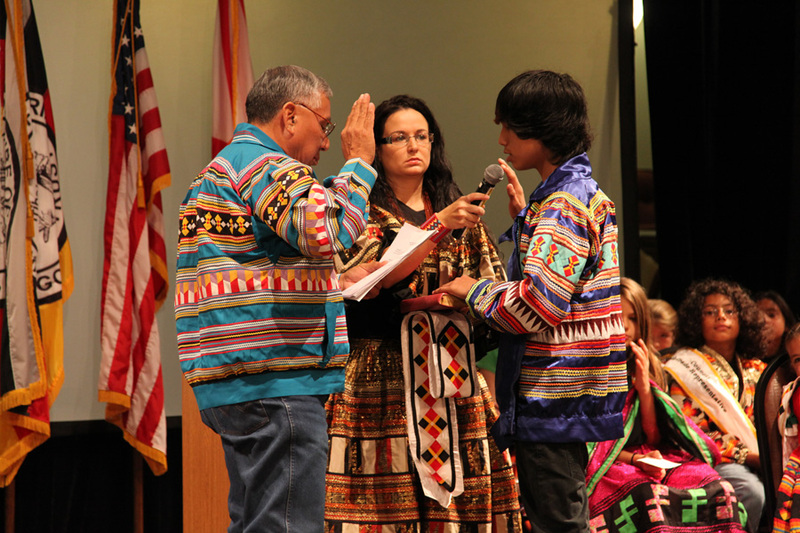 Brighton Council Rep. Andrew J. Bowers Jr. swore in 10 students, nine as elected Student Council representatives and one leading Chairman for Pemayetv Emahakv. 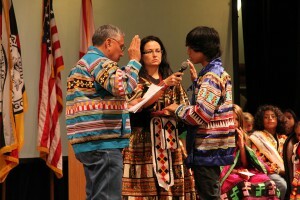 Elected representatives came forward one at a time, took their oath and then addressed the crowd, giving an acceptance speech in their native Creek language. Pemayetv Emahakv conducts its Student Council in the form of a mock Tribal Council, giving the students a hands-on feel of what the Tribal government might be like. “It’s very important to involve the students in the government process because they have to know where and how we came to be,” said Student Council organizer Jade Braswell. Prior to the inauguration, students had to get a petition and get 10 signatures just like Tribal Council representatives have to do. They then had to give a speech in front of their student body saying why they deserved the position. Jalynn Jones told students that if elected, she would do all she could to get an art room for the Charter School. Trevor Thomas, who has been a representative twice before, said he spoke to his classmates during lunch and recess and told them what he could do for them. “I just feel that I made many changes at our school for the better before, so I thought I could do the same this year,” Thomas said. Chairman James E. Billie and Brighton Board Rep. Larry Howard also attended the inauguration ceremony, watching students complete the election process. Students elected into Student Council include: Sydney Matthews, Draco Billie, Elle Thomas, Jaylen Baker, Brienna Brockman, Alyke Baker, Jalynn Jones, Trevor Thomas, Kalgary Johns and Michael Garcia.